DowDuPont’s restructured split announcement yesterday was surprising to us on a couple of counts. First the speed with which they made the announcement post deal close – we expected management to take more time to evaluate all of the possible moving parts. Second was the degree of change – especially splitting Dow Corning, which may take more time to achieve and may cost more. We see this as a settlement to get the activists off management’s backs and let them get on with the job of driving the synergies and creating the spincos without distraction – which has value. It is possible that at least one of the activists had a more radical plan of attack in mind with respect to changing the plans for the separation and that the announced move, already backed by a couple of the activists, will make it harder for anyone else to propose anything new. With this plan, we do not get a new LyondellBasell and we do not get a separate Dow Corning, which had been suggested. The moves are logical – taking businesses from Material Science that do not really fit with the focused end market and focused chemistry integration – such as water treatment. In automotive, Material Science is giving up adhesives and sealants and keeping materials. We suspect that this may provide better longer-term optionality for Material Co. The major concession from Material Science is giving up a chunk of Dow Corning revenues and EBITDA, by splitting the business in line with its end market exposure and how that overlaps with the individual spincos. The announcement changes nothing with respect to the model behind what we published last week as we were looking at the combined business – pre-split – in all our pro-forma analysis. The splits should add value versus the combined pro-forma – so, create upside to our valuation targets because of higher aggregate multiples – or why do them? We would not change the estimates and associated valuations implied in Exhibit 1 (first published last week); while the lost EBITDA from Harvey is very substantial, and we could use more detail in terms of lost production, we think there is upside to ethylene because of Harvey in 2018 and now see upside to the $5.00 EPS we see possible for 2018. Share buyback: In giving its support for the revised configurations of the split companies, one of the activists called for a substantial share buyback. 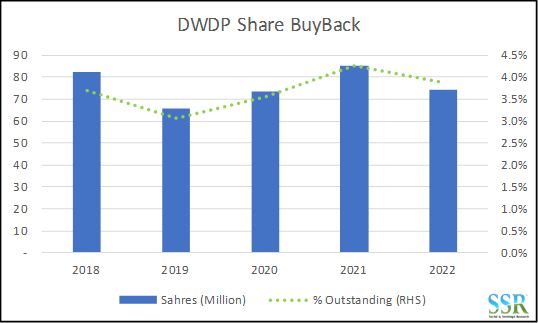 Note, that in the pro-forma analysis we published last week, a significant driver of EPS growth was assumed to be share buyback and we estimate that the combined company can buy back as much as 17% of outstanding shares from 2018 to 2022 with a flat ethylene market and as much as 20% with a positive ethylene cycle – as modeled in Exhibit 1. The buy-back per annum is summarized in Exhibit 2 for the base case (no ethylene cycle). The dip in 2019 is because of the assumed Sadara buy-in that Dow announced prior to closing – we have a price of $3bn modeled. Even if the purchase was for Dow Material Co stock and the share buyback was higher, the percent of shares retired would be largely unchanged. 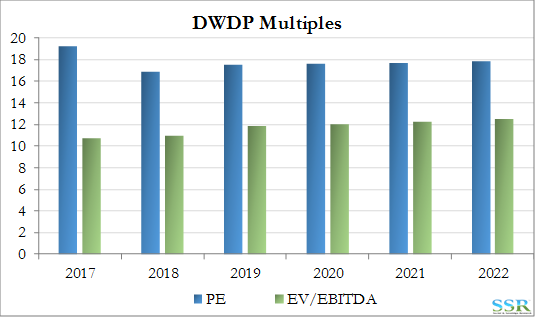 The Split Valuation Assumption: DWDP currently trades at a high multiple of both earnings and EBITDA. The multiples behind the share price targets in Exhibit 1 are summarized in Exhibit 3 and were included in the prior report. In all years, these are lower EPS multiples than the stock sees today as we are taking out some of the synergy anticipation, but EPS multiples remain high and the higher and rising EBITDA multiples reflect the expected growth. The risk to the new split configuration is that the Material Science multiple falls back in the direction of the commodity group – so, sub 8.5x EBITDA. The balance of the portfolio would then need to trade above 15x EBITDA for the splits to make sense. These are very approximate numbers as we do not know the capital structure of each company, but we would continue to caution with respect to a rapid separation of Material Co and Specialty Co, particularly given the historic poor and volatile performance of the legacy DuPont Specialty business.